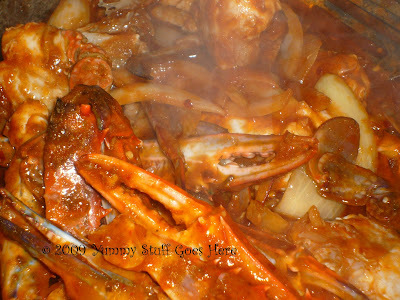 Yummy Stuff Goes Here Yummy Stuff Goes Here: Chilli Crab anyone? I can't wait for December to get here because I am heading down to Singapore. I have been told that one of the dishes that I have to try is at Ghin Moh Block. You guessed it, it's the ultimate...Singapore Chilli Crab! Anyway, this is my version. Nothing spectacular, that is why... I am going chilli crab hunting soon. Thank you all....thank you...Rita, your blog is fantastic... and I love HK ;) too.